Common Law Admission Test (CLAT) is held annually for admission into Under-Graduate and Post-Graduate courses in 19 National Law Universities of India. The law entrance exam is a national level exam which is conducted online. The 2018 CLAT exam is the 10th edition of CLAT which means the common law entrance exam came into being 10 years ago before which all law colleges had their own separate tests. The CLAT exam is the gateway to approximately 2312 law seats combined which are on offer by the 19 national law schools which admit students based on their law entrance exam score. This to notify the aspirants of CLAT 2018 that they can now access the CLAT important dates 2018. 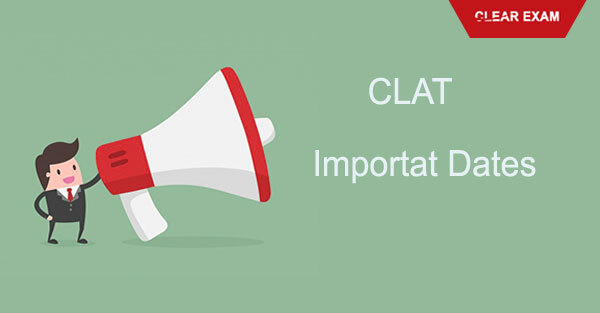 All this information related to CLAT important dates is updated with CLAT official Notification released by the National University of advanced legal studies (NUALS) Kochi. Let us move to the CLAT important dates which have been announced officially for this prestigious law entrance exam. The following table shows the dates of all events related to the CLAT exam. All 40,000 students who are planning to fill the CLAT Application Form should mark the calendar for these CLAT Exam Dates 2018. Students should all remember that all dates of the CLAT Exam except the date of the exam are tentative and subject to change as per further notification by the convening body. This brings us to an end of the information related to CLAT Important Dates 2018. CLAT Exam Dates 2018 has been released by NLU Kochi. read here details of application availability Date, admit card issue date ,clat exam, result, merit list etc.